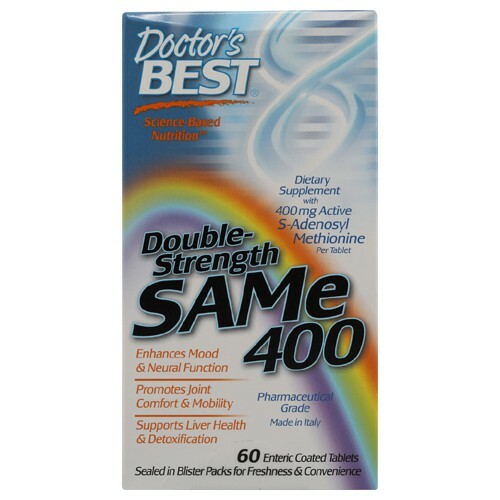 Doctor’s Best Double Strength SAMe 400 is rich in ingredients essential to the manufacture of neurotransmitters and in maintaining the health of the brain. Coming from the amino acid methionin, S-adenosyl Methionine (SAMe) is a vital in providing methyl derivatives that the brain needs. The process of methylation is important in the physiologic function of a lot of organs in the body. These substances are part of various biochemical processes in different organs including the liver, joints and even the brain and may also play a role in manufacturing the neurotransmitters and several hormones that is vital in the biosynthesis of critical neurotransmitters and hormones. Directions Take 1 tablet daily away from food, or as directed by a health care professional. Do not chew or crush tablet.